A typical kind of inspirational Ayn Rand quote which lures people in. For those of you who don’t know anything about Ayn Rand aka Alisa Rosenbaum, settle in. Rand made her name with her main two novels, “The Fountainhead” and “Atlas Shrugged”, both books depicted men and women who were industrialists and CEOs in heroic terms. While we may not have Odysseus, Achilles or Jason leading us anymore, instead we can now look up to Howard Roark, Dagny Taggart or John Galt, because in essence, due to the grace of their “genius” and “productiveness”, we are all somehow allowed to live and like dogs happy to get table scraps, we should be grateful for whatever they throw at us. By themselves, the books aren’t bad. In fact, I’d even say that “The Fountainhead” is an alright read and the film with Gary Cooper, Patricia Neal and Raymond Massey is interesting to watch only because Cooper and Neal started a torrid affair during filming which scandalized Hollywood at the time. Dominique Francon (Patricia Neal) staring down Howard Roark (Gary Cooper). Rand has always been popular with young readers or those readers who are young in mind (Read: immature) which I think explains her ongoing popularity. When you’re young and philosophically immature, it is very easy to fall for the romantic notions of heroism which Rand paints in her books. It’s only when you get a little more sophisticated, you realize that Rand’s ideals of heroism and grandeur bear an eerily close resemblance to Nietzsche’s ideal of the “Super-Man”, a concept and philosophy Adolf Hitler then used to fuel some aspects of Nazi ideology. Rand was also a racist. Big time. You don’t have to look any further than this interview she gave on the Phil Donahue show back in the 1970’s especially from 5:57 onwards. She was also a miserable human being. I don’t say that because of the YouTube videos where she shoots herself in the foot. I say that because when I didn’t know any better, I too fell in love with her books back in the 9th grade (yeah, I was a nerd). As a result I read of on all the rest of her works including “Anthem”, “For the New Intellectual”, “The Romantic Manifesto”, “The Virtue of Selfishness”,“‘Capitalism: The Unknown Ideal” as well as the two biographies done by her closest associates for years, “The Passion of Ayn Rand” by Barbara Branden and “My Years with Ayn Rand” by Nathaniel Branden, her onetime intellectual heir turned lover. I’m not going to discuss the dirty laundry of her life, only to say there was lots. Lots. She had no problem treating anyone like dirt especially if they got in her way and this included her husband, her sister and eventually, the Brandens. This justified her philosophy of selfishness, I think. Friends in high places. 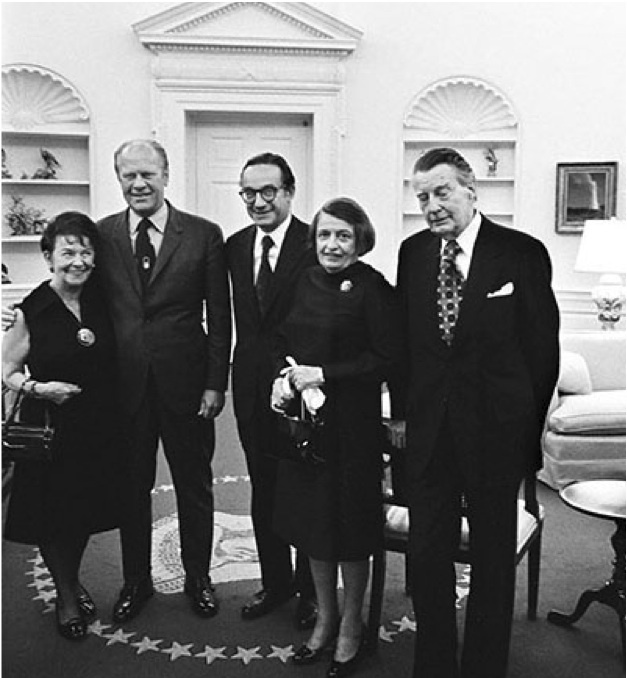 Rand and her husband, with former president Gerald Ford and chairman of the Federal Reserve, Alan Greenspan. I also don’t think it is a coincidence either why the political and economic ultra-right wing in the United States fall hook, line and sinker for Ayn Rand, like Rand Paul or former Chairman of the Federal Reserve Alan Greenspan (the same jerk who oversaw the financial meltdown of 2008) who was a personal friend of Rand’s for many years and attended her weekly talks at her NYC apartment. Prominent economist Jeffrey Sachs can’t stand Rand and he sums it up best in this video (from 2:49), especially on John Galt’s speech in “Atlas Shrugged”. It’s about the absence of any compassion whatsoever. And big business and CEOs alike would like to think that like Rand’s heroes, they too are heroic, and because of their privilege and talent, also deserve to earn and take anything they want…never mind workers rights or paying taxes which give funds to keep a community alive for municipal services like libraries or fire trucks. Sears Roebuck & Company is about to go under any day now and that’s due in large part to their idiot CEO who tried installing Ayn Rand’s brand of laissez-faire capitalism into the business. The result? Virtual bankruptcy for a company which lasted almost for over 100 years. Great productivity, eh? Rand had very strange ideas on misogyny, physical looks and the “halo effect” and obnoxious businessmen. You can read it all here. 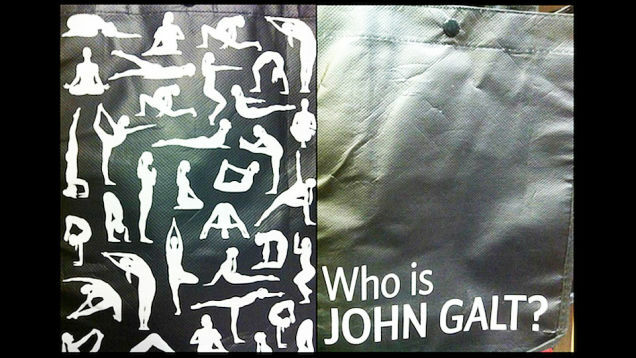 It’s no secret that Lululemon’s former CEO Chip Wilson used to worship at the altar of Ayn Rand. 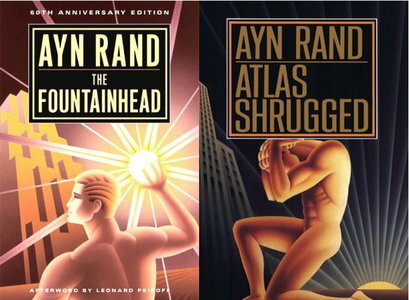 In fact, they had several campaigns highlighting Rand’s work including using the famous question “Who is John Galt?” in one of their ad campaigns as well as strongly pushing their ambassadors to attend the culty and creepy LandMark Education seminars until fairly recently, all in the pursuit of “greatness” to use Chip’s word. What’s the lesson to today’s tale? If you ever encounter a company, a person, a celebrity who professes to love Ayn Rand and her ideas, I would only say watch them closely because I can almost guarantee that you will be dealing with a juvenile, not an adult.